Spring is approaching and this is also the motto of this wine fair! 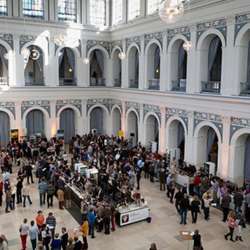 We will meet again in the stylish venue of the historical Hamburg Stock exchange, where more than 70 producers will present more than Protected content ! The focus will be on white summer wines from the Protected content . The exhibitors are mostly from Germany's wine-growing regions, but all major wine producing countries in the world will be represented! This is a free tasting event; the exhibitors will not charge any fee. I managed to get a group discount; we will get the tickets for 8,50 € (instead of 13 €). For this I will buy them at the entrance. Please be there on time Protected content at the main entrance! If you come by public transport, the closest metro or bus stop is Rathaus or Jungfernstieg.